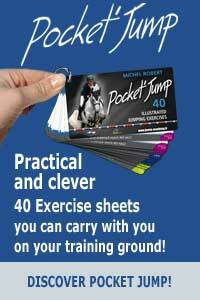 Michel offers an exercise aiming at developing Alice’s horse different length of strides. The latter must be able to lengthen his stride calmly while maintaining a steady speed before, above and after the exercise’s set-up. This ability to shorten or lengthen the horse’s stride is important especially on lines that require adapting the distance between two fences. It’s also an efficient way of developing the hind legs pushing power enabling the horse to gain some strength and height above fences. Alice’s horse has kind of a short back and he’s always rushing. Michel sets-up some trotting poles then some cantering ground poles. The goal is to increase Pharaon’s length of strides by modifying the set-up as the exercise progresses. As for Alice, she needs to adjust to her horse’s behaviour and never interfere with her horse’s stride while channeling his excess of energy. Michel teaches her how to improve her control over the horse using her aids in a better way. In the meantime, the rider has to stay perfectly serene in her mind and body in order to let her horse’s movements go through without fueling his excitement. The exercise has to be performed with a minimum of physical constraints for the horse so they’re basing the work on Pharaon strong abilities and easing in his weakness.
. It’s possible to lengthen or shorten a horse’s stride while maintaining the same given speed. .While practicing the exercise, move your hips forward to avoid jabbing the saddle and crushing the horse’s back.
. Use your outside rein by driving back your elbow to slow down the horse. 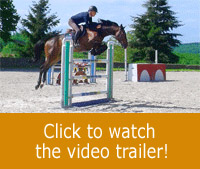 The inside rein maintains the flexion but should not be used to slow down the horse.